Known proudly and affectionately by fellow freethought bloggers as “the Richard Dawkins of Bangladesh”, Roy had been on a visit back to Bangladesh from the United States to launch a new book. He had been repeatedly accused and threatened over claims that his writings on reason, freethought and humanism were “blasphemous” or “defamed religion”. “He was like my brother. This a great loss for the nation, and for all freethinkers in the world. We called him Richard Dawkins of Bangladesh. He was the nicest person I ever met. Just yesterday he wished me well on my birthday, today he is dead. I can’t believe this! He was my dearest friend and we worked together for 6 years against religious fundamentalism. He was my hero, and hero of many young freethinkers in Bangladesh. Many young people were inspired by him so much. Now we have a big atheist and agnostic community, gay and lesbian community, that was possible only because of him. He was our support in every step. Whenever we had any problem, he solved that very quickly. “We at the Center for Inquiry are shocked and heartbroken by the brutal murder of our friend Dr. Avijit Roy in Bangladesh, it is speculated at the hands of Islamic militants. Dr. Roy was a true ally, a courageous and eloquent defender of reason, science, and free expression, in a country where those values have been under heavy attack. Doubtless all partners in this International Coalition Against Blasphemy Laws would similarly condemn this horrific attack on freedom of thought and expression. 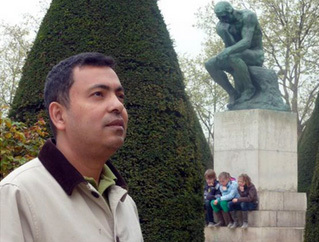 Avijit Roy worked hard to give a voice to reason and to secular, democratic principles.